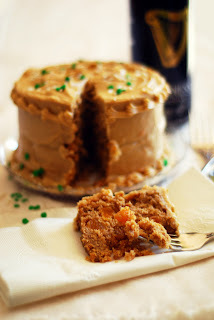 Although I'm not Irish, any day that gives me an excuse to bake something out of the ordinary is a day worth celebrating. 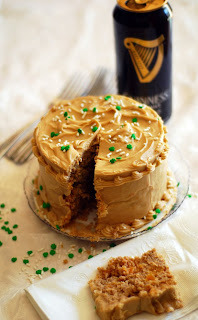 Traditionally on St. Patrick's Day, I have made chocolate Guinness cake but this year I decided to go for something a little different once I saw this recipe on tastespotting a few weeks ago. I can't say I don't miss the chocolate, but the frosting is amaaaazing. If you ever wanted to know how to make a caramel frosting without actually making a caramel, this is the frosting for you. In a recent past life, I was a cake decorator. The frosting isn't the most forgiving (hence the extra piping to cover up mistakes) and won't give you the smoothest sides, but the taste was absolutely worth the effort. I baked the cake batter in my new 5'' layer pans and made 11 cupcakes from the rest of the batter. The original recipe calls for a 9'' springform pan. Any pan you use, be sure to keep an eye on it as it's baking. I used an apricot jam in the middle of the cake rather than frosting and, one more thing, I cut the sugar down by half - I didn't think 1 cup of each type of sugar was really necessary and the cake tastes great without the extra. My modified version is below. I hope everyone has a great St. Patrick's Day! Pour the beer over the oats in a medium bowl and let sit for 45 minutes to an hour, or until the oatmeal has absorbed the beer. Preheat the oven to 350 degrees F. and grease the pan(s) you're using to bake the cakes in. Sift or whisk together the flour, baking powder, salt, cinnamon and nutmeg in a small bowl and set aside. In a large bowl, cream together the butter and sugars until well combined. Add the eggs one at a time, mixing until creamy (about 30 seconds) after each one is added. Add the flour mixture alternately with the oatmeal and Guinness mixture, beginning and ending with the dry ingredients. Fold in the apricots. Divide and pour the batter into your cake pan(s) and bake anywhere from 20 to 50 minutes depending on the size of the pan you used. A toothpick inserted in the middle will come out clean when they're done. Cream the butter, cream cheese and brown sugar until the brown sugar is dissolved into the butter and cream cheese, about 3 to 4 minutes. Add the confectioner's sugar a cup at a time, tasting to make sure the sweetness is to your liking. I went for about 2 1/2 cups. Add the vanilla extract and salt and beat until lighter and creamy, 2 to 3 minutes more. 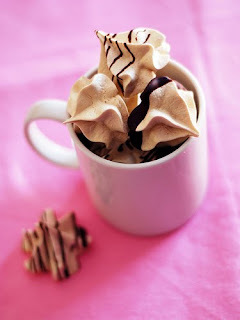 Meringues are one of the simplest and cutest cookies one can bake - they're also gluten free, low in fat (fat free unless you add nuts or chocolate), and relatively low calorie as long as you keep them small. I somehow always end up with bags full of egg whites in the freezer. I guess from making a household favorite, crème brûlée, as well as homemade ice creams and custards. Sundays at my house call for something gluten free, sweet, and fun to photograph. These fit the bill. 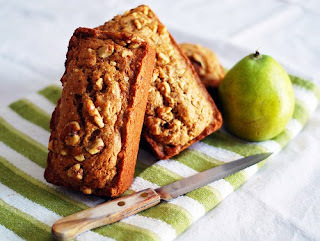 This is a modified version of a recipe from Tish Boyle's book The Good Cookie - which every baker should own. My copy is covered in grease and the binding is about ready to go. But that's how I like my cookbooks - well-used :) If you want regular meringues, just omit the espresso powder. 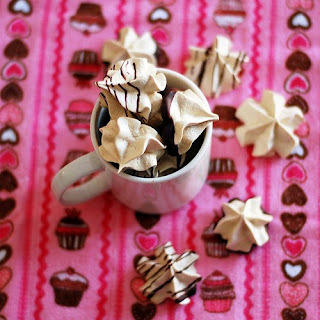 I adore piping anything, so I always use a bag to pipe meringues fitted with a large star tip. But a teaspoon or tablespoon would work just fine as well. Preheat the oven to 200 degrees F. and line a couple of cookie sheets with parchment paper or foil. In a mixing bowl, combine the egg whites, salt and cream of tartar. Start whisking on medium low speed until they are frothy and white. Add the espresso powder and whisk until soft peaks form. Add the sugar a tablespoon at a time and whisk until the whites hold stiff peaks. Stir in the vanilla extract. 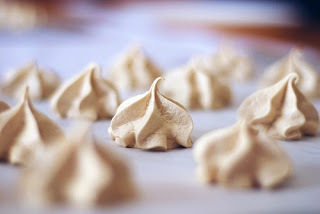 Pipe or spoon the meringues onto the cookie sheets and bake for 1 1/2 to 2 hours, or until dry to the touch. Let cool, then drizzle with chocolate or dust with powdered sugar. I'm probably jinxing things by saying this, but today was the first day it felt like spring was finally on its way - lovely sunny skies, above 32 degrees F, people were out and about. I love it when everyone starts emerging from their hibernation after winter. Due to this good mood swing, I had the urge to bake something. 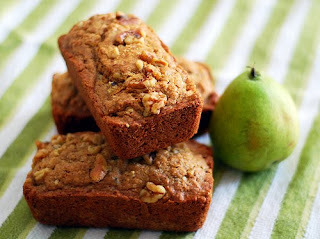 4 d'Anjou pears getting soft on the counter... pear bread! Easy and it can be frozen for future use and I don't have to eat it all now. Last week I found 5 mini loaf pans in the back of my baking pan cupboard and since then I've been baking all loaf bread recipes in mini. So much cuter than a large loaf, don't you think? These also look adorable wrapped in a cellophane bag and tied with shiny ribbon for giving to friends and family. 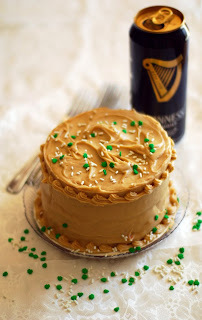 This recipe comes from Southern Cakes by Nancie McDermott - a highly recommended book for anyone who loves to bake cakes! 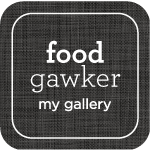 The recipes have always been delicious, easy to follow and don't call for anything exotic. 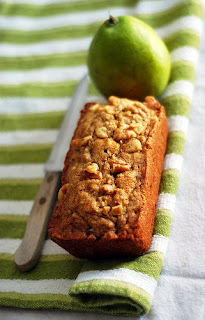 You can bake this in any size pan(s) you'd like - tube pan, Bundt pan, or mini loaf pans. I'd bet it would even make muffins rather well. Preheat the oven to 350 degrees F and grease the pan(s) you're using lightly. Whisk together the flour, baking soda, baking powder, salt and cinnamon in a large bowl and set aside. In a smaller bowl, take about 1/4 cup of the flour mixture and stir with the chopped walnuts until coated. In a medium bowl (I used a handheld mixer), combine the butter, eggs, sugar, pears and vanilla until everything is well blended. Scrape this mixture into the dry mixture along with the walnuts and stir just until everything is evenly moistened.